The German data center has also submitted their sales data record to you for October, 2011. Your job again is to update the online_retail data set to include the new German sales records. ​Unlike France, the Germans have provided you with two data sets, GERMAN_SALES_201110 and GERMANY_PRODUCTS. Download the two files below and save them in the same directory folder as the online_retail data set. The German sales records are split into two data sets. We will merge the two data sets and combine the data into one data set. The data step above merges the sales data set with the product data set that contains the product description and unit price. 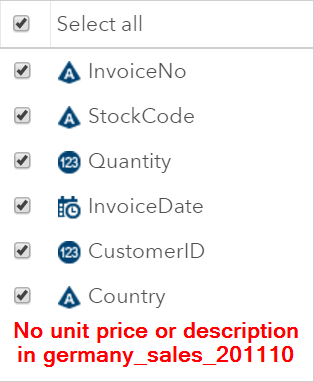 In the sales data set only. 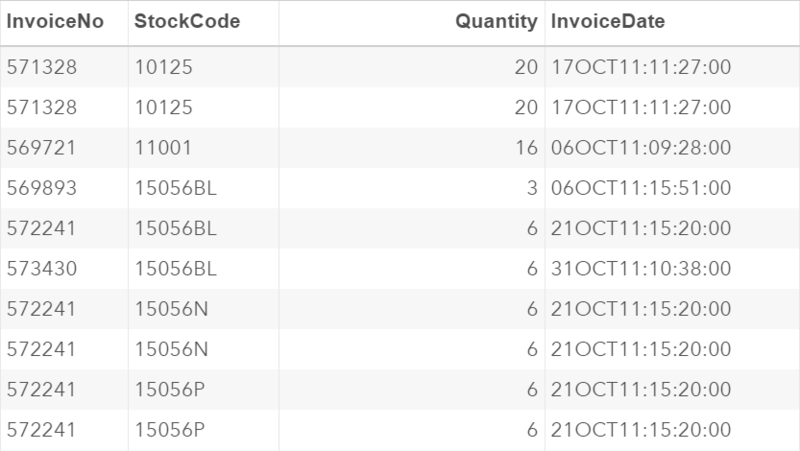 ​In the product list data set only. Let's find out the match rates between the two data sets using the FREQ procedure. There are 1,378 matched observations. There are also 1,115 observations that are found only in the product list data set. These are likely to be the products that were discontinued, and are no longer for sale. These observations can be ignored. ​Finally, there are 56 observations that are found in the sales data set but not the product list data set. 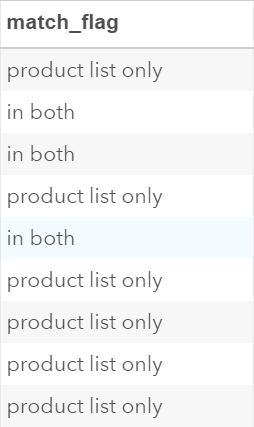 These are the sales of the products that are not defined in the product list data set. We will also ignore them for now. Now, we are going to ignore the unmatched observations and ​create a data set that contains only the matched observations. Our goal, again, is to load the sales data from the German data set to the online_retail data set. Before we do that, we must ensure the germany_201110_clean data set has the same structure as the online_retail data set. ​Let's run a COMPARE procedure to compare the two data sets. The result shows that the two data sets are consistent in data set structure and variable attributes. 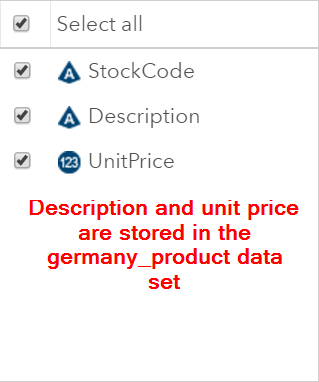 Now, we can update the online_retail_new data set to include the new sales data from Germany. A new online_retail data set (i.e. online_retail_new) again is created. It combines the original online_retail data set with the germany_201110_clean data set.